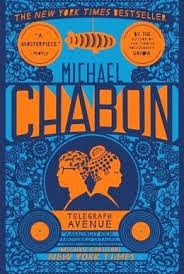 a book chick: "Telegraph Avenue"
my take: Oh, man, this novel has everything and the kitchen sink. Most of the way through the book I thought, "This would make a great movie" ... it seriously has it all - a large cast of characters, crazy cars and clothes, outbursts, violence, birth scenes, a blimp, kung fu movies, a funeral and a mighty good sound track. When I finished the book I read the interview with the author and he started writing this as a pilot for a television show. Which explains why the cast is large. And sooooo dysfunctional. A couple of the main characters own a record store in modern day Oakland, CA. One is black, one is white. Each has a wacky personality and lots of personal problems. Then their wives. And their kids. And a father. And a father figure. And a semi-gangster funeral director/city councilman. And a former NFL big shot. The book goes wide and deep. You get your money's worth. One entire chapter is one looooong sentence. Kind of amazing and breathtaking.